I had time to sneak one more Halloween card in for this year! 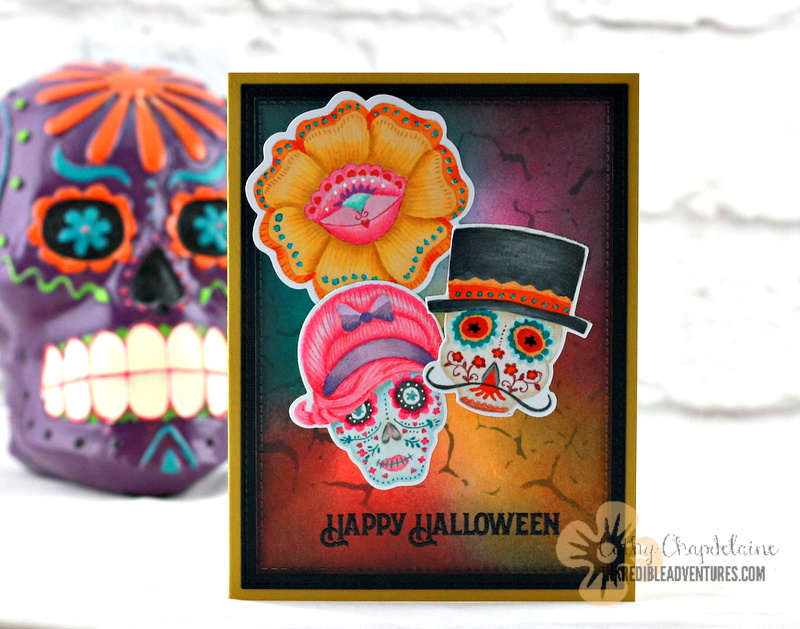 My hubby and I dressed up for Halloween last year in Dia de los Muertos costumes, so when I saw these stamps designed by Becky Fleck for Photoplay, I had to have them. The name of the stamp set is “Matilda and Godfrey”. I colored the sugar skulls and flower with Copics and added colored pencil details. The flower is from the Sizzix “hola flower” stamp and die set. For the background, I blended Peacock feathers, Spiced Marmalade, Picked Raspberry and Abandoned Coral distress inks and then inked Black Soot around the edges. I also inked a Prima stencil over the top with Hickory Smoke distress ink. To finish it off, I heat embossed the sentiment from this set with black embossing powder. Hope you enjoyed and have a Happy Halloween!